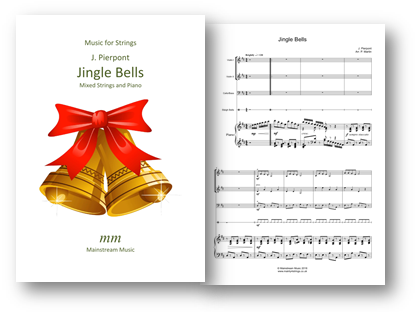 An arrangement for mixed junior strings of Pierpont’s ever popular ‘Jingle Bells’. The PDF also contains parts for viola (doubling that of the easier violin II parts) and melody parts for both viola and cello. The backing track folder contains a slower practice/rehearsal track. Purists might wish to change the note A at the end of bar 7 in the melody parts to a C#! Click here to listen to a recording of the piece.